If you want to live an extraordinary life, you're in the right place. Malaysia offers a pleasant tropical climate and the island of Borneo in particular boasts an amazing variety of eco treasures that include virgin rainforests with unique wildlife and pristine coral reefs teeming with marine life. Add to it tiny Sipadan Island, repeatedly voted the best dive site in the world, and you know where you want to take your PADI Instructor Development Course (IDC). During the IDC, you'll learn to use and adapt the PADI System of diver education to individual student needs. Your PADI IDC at Sipadan Scuba is divided into two distinct segments, the 5-day PADI Assistant Instructor (AI) course and the 6-day PADI Open Water Scuba Instructor (OWSI) program. Combined the two courses form the entire IDC and both courses must be completed before attending the PADI Instructor Examination (IE). At Sipadan Scuba we believe in personal attention to your needs as an instructor candidate and provide individual feedback regarding your performance throughout the course. Prior to the IDC we offer a free 1-week PADI IDC Prep Course that we highly recommended as proper preparation will be key to your success. The goal of the IDC is to prepare you to function as a scuba instructor, passing the IE (=it's easy) successfully will be a result of the training you receive. Our instructor development team led by CD Jerry Reichart has decades of scuba experience to pass on and will always be on hand for advice - after all you might join our staff later on. 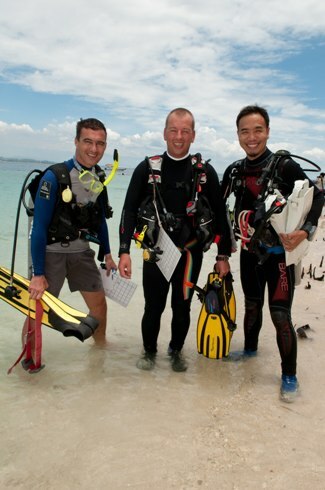 The entry requirements to the IDC are identical to those of the PADI OWSI program.